I must have been standing on the wrong line when they were handing out hearts and gotten a second pancreas or something because I just don’t like love songs. Mostly because they don’t make any sense to me, and in the battle between heart and mind, my brain has my puny little second pancreas in some of kind of unholy sleeper hold. So while most folks can shimmy along to the music with an alcoholic fruit drink balanced in one hand, I’m wondering how an “easy lover” is one who’ll deceive you and make you regret meeting her. By my reasoning, that would be hard as love goes, although if Philip and Phil were singing about a “hard lover,” well, you’d probably be reading an Irish cream joke right about now. Both tracks come from Bailey’s elpee “Chinese Wall,” which was produced by Phil Collins (Bailey was a member of Earth, Wind & Fire, whose horn section Collins appropriated for his solo sessions, in case you’re looking for the connection). 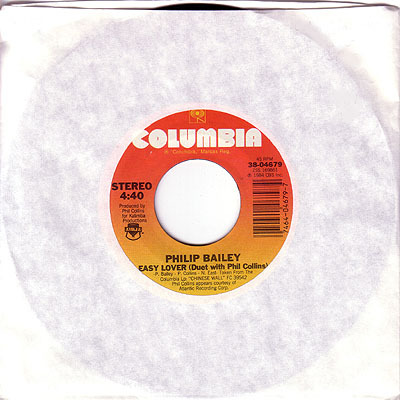 So this is technically a Philip Bailey single (Phil is credited with the duet on the A side). The 12-inch single features an extended version of the A side, known in these parts as the “Welcome to Hell” mix.